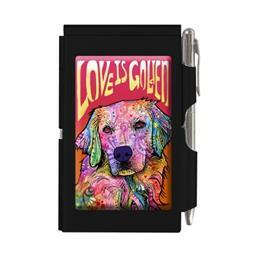 LOVE IS GOLDEN - FLIP NOTE. You will wonder how you ever lived without our best-selling Flip Note. Full-color Dean Russo art reminds you of your furry friend wherever you go. The blank note pad has a metal case- keeping edges protected and a handy retractable pen keeps the cover in place. Slide the pen up and the cover springs open. Notepad is perforated- 50 sheets. Flip Notes are great for purses backpacks and briefcases. Pen replacement and pad refills available. Sticky note pad refills also available.